The darkness makes Gerard’s features soft when he faces me, his black hair fading into the shadows, the sunlight a mask across his gray eyes. I miss the sharpness of his features, his model cheekbones and cleft chin hidden by the artificial night the pier and its intricate support system create. One foot in front of the other, one print in wet sand added onto my trail after another, I take the last few steps to Gerard. He looks up. “I knew you’d come back here.” The sunlight hits his chiseled face. “You know me too well.” I sink down beside him carefully and open my bag. Danish chaos. It’s everywhere. My iPod, my extra shirt, my notebook. This will take some time. I pull my notebook out with reverence and attack it with the shirt, using the unsullied portions of purple cotton to wipe off the cover. Safe. Good. I need my memories. I hate them, but I need them. I pull out the iPod next. I go after it with the same vigor as the notebook, but Gerard takes both shirt and gadget from my hands and starts cleaning it with care, occasionally using his hot breath to make enough moisture to get some of the stickier bits free. “You’re lucky, nothing got into any of the jacks on this. Guess that’s why Apple makes them so small.” He hands the iPod back to me and tosses the shirt behind him. He turns away from me. I want to be nice, I do, I want to make up. Hangups and history bite me over and over, gnawing at my skull. It isn’t his fault my first love ended with me a broken shell, barely able to get away and try to fill back up again. He tilts his ear toward me, but doesn’t speak. I try again. He turns toward me. Smiles. I smile back, and wipe his cheek with the recovered shirt, careful to use the one remaining clean part on the hem. He wraps his arms around me. I fall, forget the world around us. “I got a letter.” This is mumbled into his shirt. “You have to go back someday Ali.” He rubs my back. He smells like strength and Old Spice. I cry. “He’s your son.” More back rubbing. My fingers dig into his lower back, his upper thigh. It makes the world stop spinning. “She took him from me! And she’s dead now, serves her right.” His shirt was beginning to soak and made my cheek feel clammy and unreal. I found a dry spot over his heart and let go. We stayed there, entwined, until the afternoon heat drove us out towards home. He took off his shirt and let me use it to clean up. I splashed the salt of the ocean on my face. We both marveled at the water and dug our toes into the soft sand at the edge of the waves. I stared towards the sun and wondered if Gerard was a good enough thief to take one of the boats out there. We’d both needed to run from Vegas. Though it was a jail sentence instead of a death sentence he faced. My small tremors do not alert the clerk and I move around towards the front awning to make sure he is still in the room behind the front desk. The coast is clear and I open the front door and slide in, letting out my held breath in a measured sigh when I get through without my bag catching or the door slamming. I breathe in quickly, and clamp my lips shut so the growls of my stomach can’t escape. I smell the yeast in the bagels, but not the cheese. I wish I had time to get a cup of the freshly brewed coffee too, but then I would be a mess if things go bad and I have to run. Thin hotel coffee cups do not travel well in the best of circumstances. I flip open my messenger bag and start tossing bagels and little plastic cups of cream cheese in, looking to the front desk for any signs of life. The coast remains clear, maybe the clerk decided to pleasure himself in the early morning hours. It works out for me. I throw the flap back down on my pack and head to the door. My bag slaps against my thighs and I hope my bagels don’t get crushed by the movement. I smash my hands against the glass door and get outside as footfalls almost make it to me. Well, at least that trick worked. 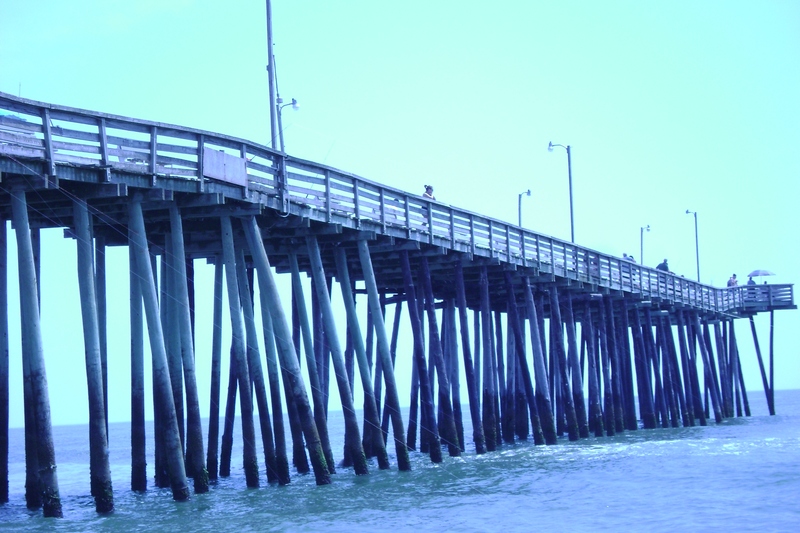 I run back towards the pier, wanting to reclaim my home base and hide. Once I duck underneath the wooden slats that clod from the hotel will never be able to find me. I guess he remembered me from the other times I gleaned breakfast from his fine establishment. Shops opened their doors as I passed, getting ready for another day of tourists. The sun is above the horizon line now and I wish I had time to dig my shades out of the bag. Light permeates everything and manages to sting me even as I run. So I keep looking at the ground. Glancing up to calibrate how far I’d made it down Main Street, I realize I missed my turn. I stop, almost falling over from my bag bouncing against me. I can’t hear any foot falls behind me, the world is filled with the scraping sounds of displays moving to the outside of stores. I dig my sunglasses out of my bag and put them on. Sweet relief. Except for the smear. Stupid me. I should’ve looked while I stole. I throw it on the street beside me and turn back down towards the water. I have to clean out my bag before it gets any worse. I think about going home. Just because Gerard couldn’t understand my upset does not mean he is a bad guy. He loved me enough to get the hell out of Vegas. Walking towards the pier, I decide to wait for him to find me. Or the mafia. It’s more prevalent in Vegas than you would think, don’t let yourself be swerved by the hype. There is a smell of corruption laying over a city the mob has a hand in. It’s always there, an acrid stink of lost innocence and dead bodies. I would become one of them if I went back. My mother survived for awhile because my father left a strong enough reputation behind, and she allowed Anthony to see our son. I don’t agree. I should’ve brought my boy with me. His father was bred to lie. The pier fills my vision now, baked by the sun and full of people, the diehards from the early morning hours displaced by the first wave of tourists who pay for access to the sea. The tide is in and quiet, lyrical, swirling foam covering my flip-flop clad feet. It calms me, prepares me for the task of cleaning. Best done under the pier where I can take my time. Then I see him. Gerard. He sits with his arms hugging his legs, his chin resting on them. The tears on his face glisten in the few rays of sunlight that sneak underneath the wooden slats above. Seven hundred more words, or there abouts. I’ll post the next set in a few days. Hope you enjoyed the read.